Here at the farm in Denmark, I managed to catch a single yellowhammer (Emberiza citrinella) close to the hedgerow last week. Again I’m attempting to apply my tactic of taking multiple photos of the bird in hand and trying to “work it out” later, with the help of the many on-line resources available (including experienced ringers) which are invaluable! According to Jenni & Winkler (1994) the postjuvenile moult involves all lesser, median and greater coverts, putting them out of the question when searching for moult limits, however it is always worth a look! The next step is to search for a moult limit among the tertials, carpal covert, alula and tail feathers which may be partially moulted in some birds during the postjuvenile moult. Adults on the other hand, undergo a complete postbreeding moult, which means it SHOULD be possible to differentiate the two age groups at the moment. 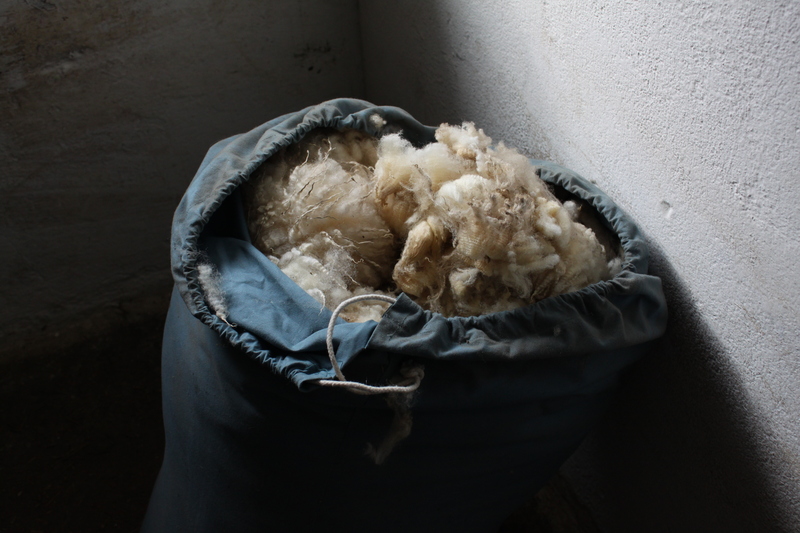 A limited prebreeding moult has also been reported in some birds, but this was restricted to the head and upperparts. Having a closer look at the tertials, the innermost tertial appears to have a darker center and a more clearly defined brown edge compared to the two larger tertials where the border appears more diffuse. According to Dunn & Wright (2009) tertials with a distinct boundary (as seen in the innermost tertial) are typical of first year birds. However the DigiGuide from Ottenby, suggests that this is typical of adult tertials, causing me some confusion. So it is possible a moult limit is present in the tertials, but I’m unsure which feather belongs to which generation. Furthermore looking at the secondaries, they appear notched, or heart shaped at the top, which Dunn & Wright suggested was also typical of first year birds, with adults having a more flat or square appearance. However, I’m still not confident that I am correctly interpreting these subtle differences, if they are even present. Comparing the photos of the primary coverts, alula and carpel coverts with those in the DigiGuide from Ottenby, I didn’t get very far. To be honest I’m not exactly sure what to look for. The primary coverts don’t appear to be loosly textured, and they are quite glossy, possibly suggesting adult like. The pale yellowish-buff edge on the middle alula appears less green-ish that that of the smallest alula and the carpel covert – but is that just my eyes? 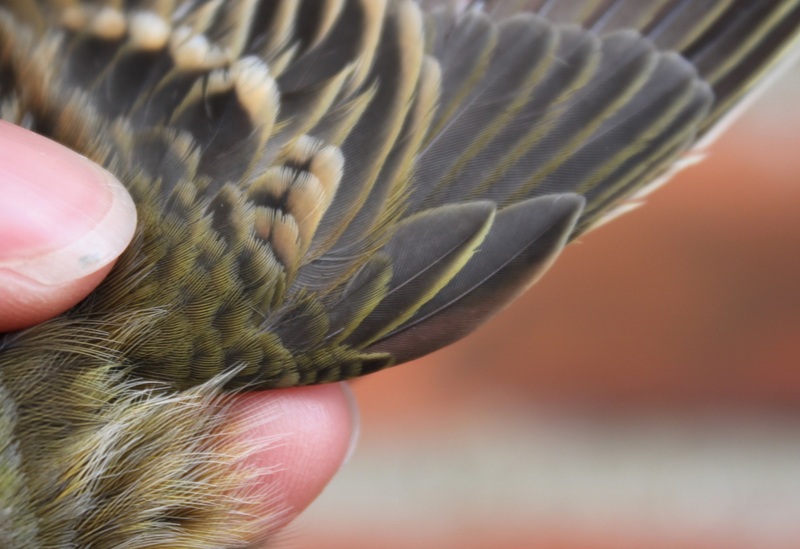 or could this be a result of wear with the difference only evident towards the tip of the feather? The extent of white on the 5th and 6th tail feathers was mentioned in the literature, but I don’t think this bird fits into any of the extremes where it can be used to assist with ageing. However the shaft colour of the upper tail coverts may give us a clue to sexing. 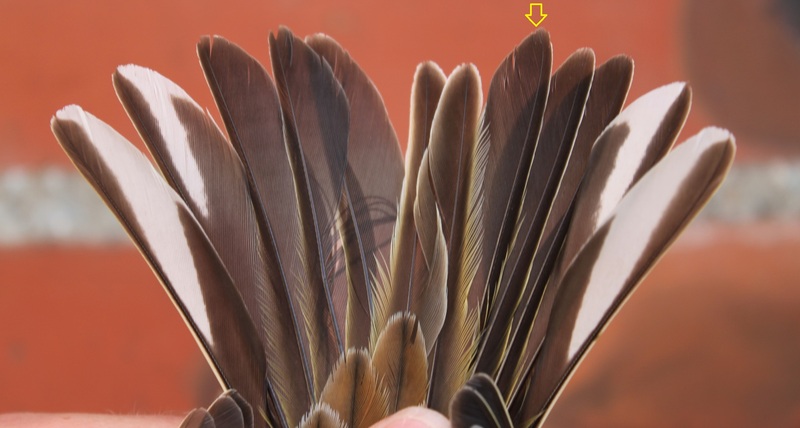 In males the shaft of the upper tail coverts is a similar colour to the feather (chestnut brown) whereas in females the shaft is darker, almost black, as seen here. My conclusion; female yellowhammer – age- to be continued! After four months travelling in South America we arrived back to Denmark in the middle of March. 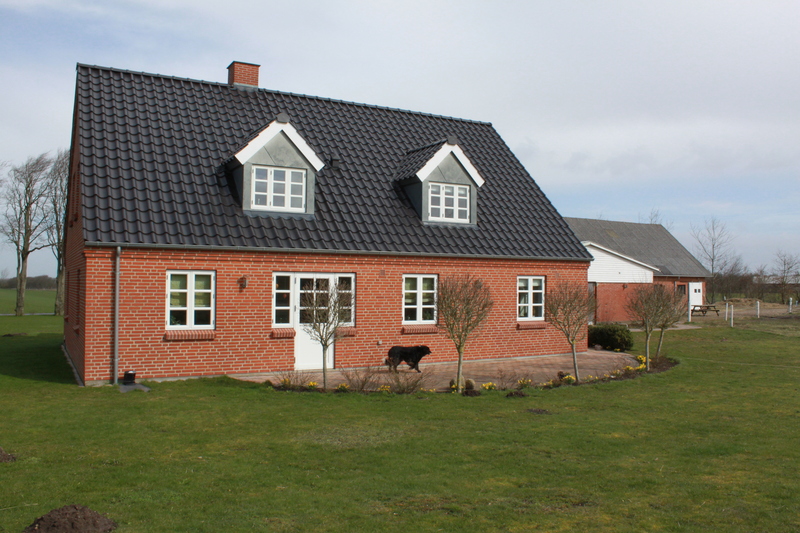 We are slowly adapting to the fresh spring weather (with a light sprinkling of snow yesterday), unpacking, sorting, washing and getting used to our new lives in Skive, where Rasmus’ parents live. We are very thankful to have a place to stay while we sort out the next steps in our lives. 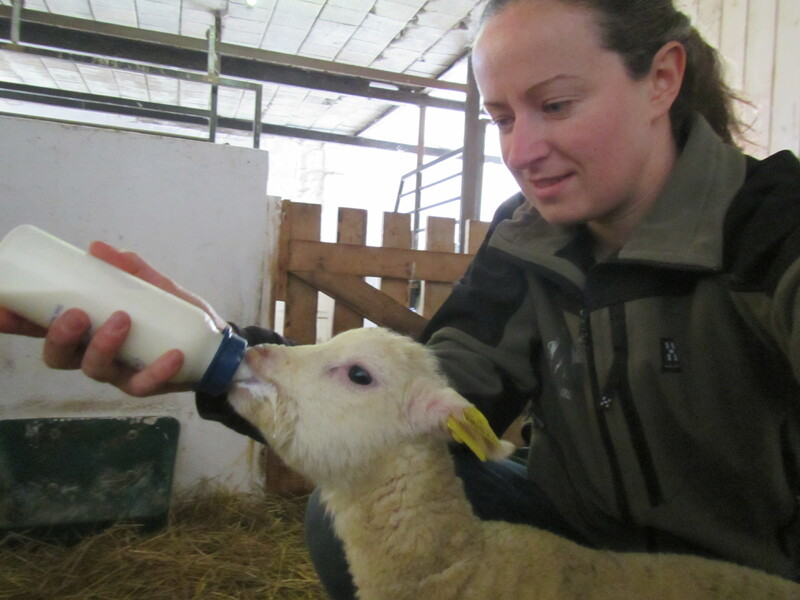 I am especially thankful we are living on a small farm, about 5km from the city, surrounded by nature and a host of farmyard animals, including a sheepdog (Max), 3 cats, 2 horses, 20+ chickens, 8 sheep and, at the last count, 8 lambs! Our daily lives have changed drastically in the last few weeks; from sun cream, battling with Spanish and sightseeing to collecting eggs, feeding animals and playing fetch with a very eager sheepdog. We have, in many ways, gone from one holiday to another. Although I grew up in Ireland surrounded by pets (dogs, goldfish and hamsters), and I was very interested in horse riding for a few years in my early teens, I have never really spent much time with “farm” animals. I have accidentally taken over the role as “fodermaster” (head animal feeder), which surprisingly takes up more time than I expected. 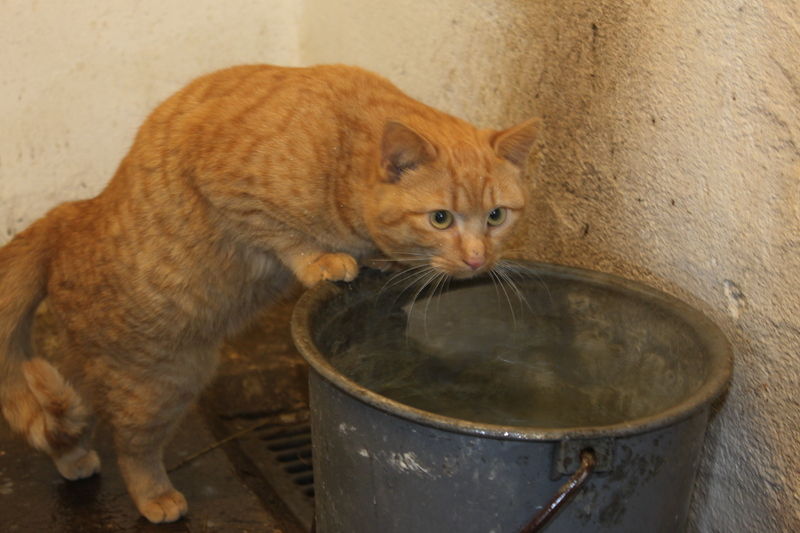 My day is now filled with trips to the stables (and many changes of clothes) to provide food and water for a host of hungry animals. 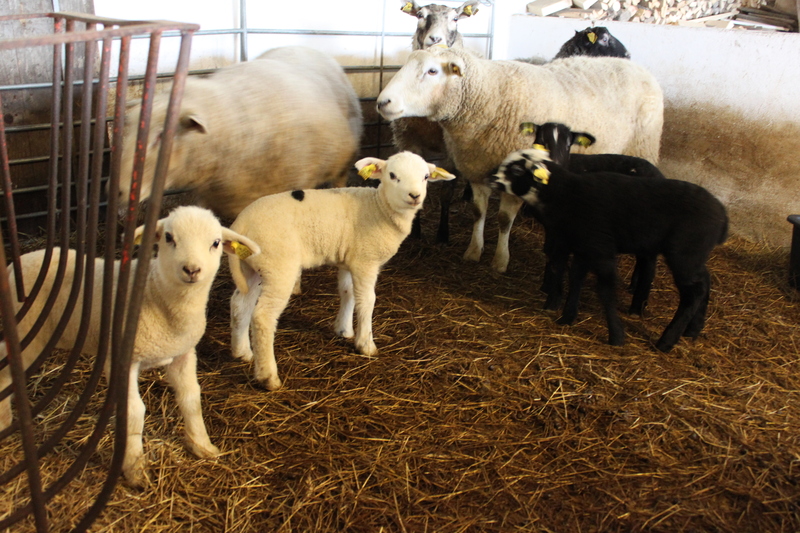 As it’s lambing season, the ewes are kept in the stable, both to protect the newly born lambs from the cold (spring takes its time to arrive here) and the possibility of predation from foxes or a passing wolf. Wolves have recently recolonised Denmark after 200 years absence! All the other animals, except Magnus the ram, sleep under a roof. 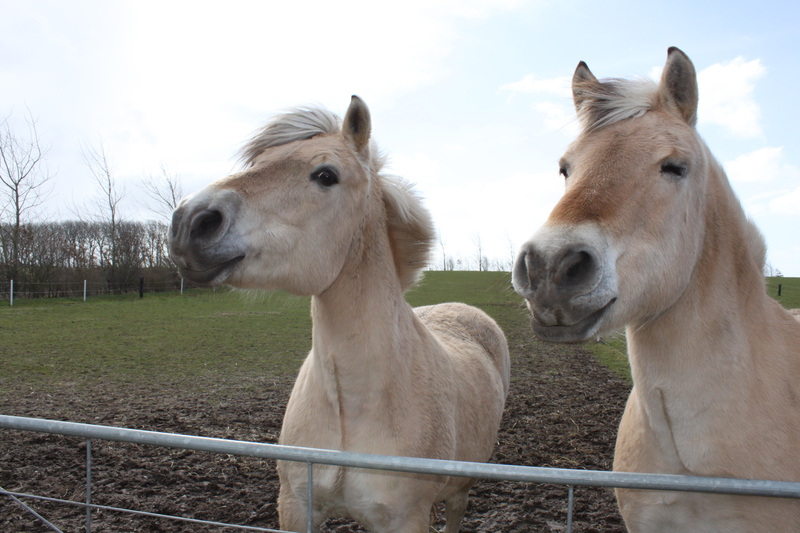 The horses, who spend there day out in the field retreat to the shelter of the stable overnight and the hens are tucked up in the hen shed by the time it gets dark. 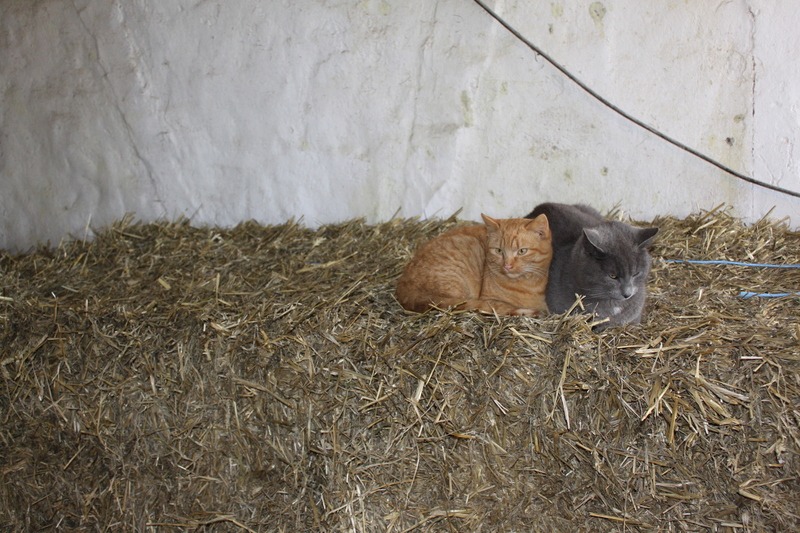 The cats are very happy cuddling up together on the straw bales while the dog get the luxury of sleeping in the house! In the morning one of the first tasks is to fill the empty stomachs. The bleating sheep get very excited when they receive their corn mix and silage which keeps their jaws busy chewing during the day. Among the sheep there is one lamb, which at the start, didn’t thrive and grow like the others. 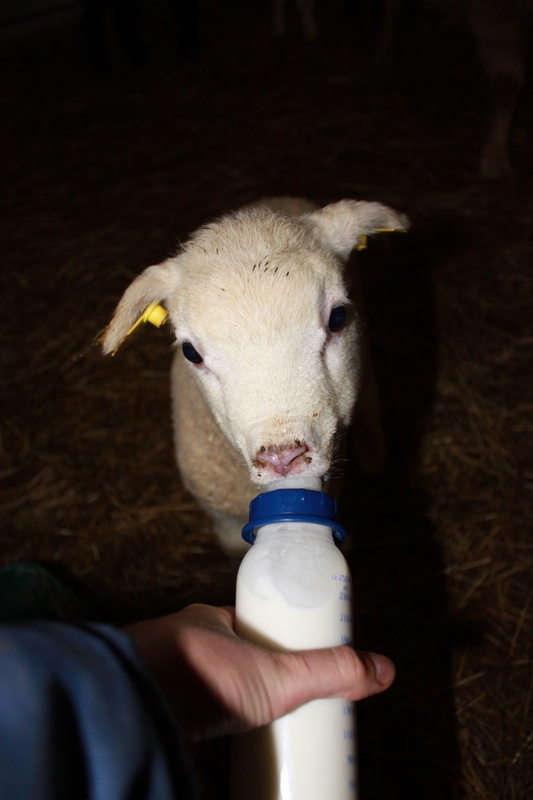 We made the decision about a week ago to provide it with supplementary food, which it gets via a baby’s bottle. This task I have also taken on, one which gets me out of bed eagerly every morning! Little “Tiny” is growing stronger everyday! Before being released back into the field the horses get a cereal snack and some silage to keep them happy. Releasing the hens is a slightly more tricky affair. They haven’t exactly learned where they are “supposed” to lay their eggs, despite many encouragements with a rubber fake egg (it does exist!). Each morning a single egg must be collected from behind the hatch, otherwise upon opening the hatch, the egg will roll outside and break. That means that each morning I must make the somewhat treacherous journey through the hen house, between the two rows of clucking hens, complete with a puffed up cockerel, to collect that single egg. There isn’t much space in there and I must admit, it scares me a tad! 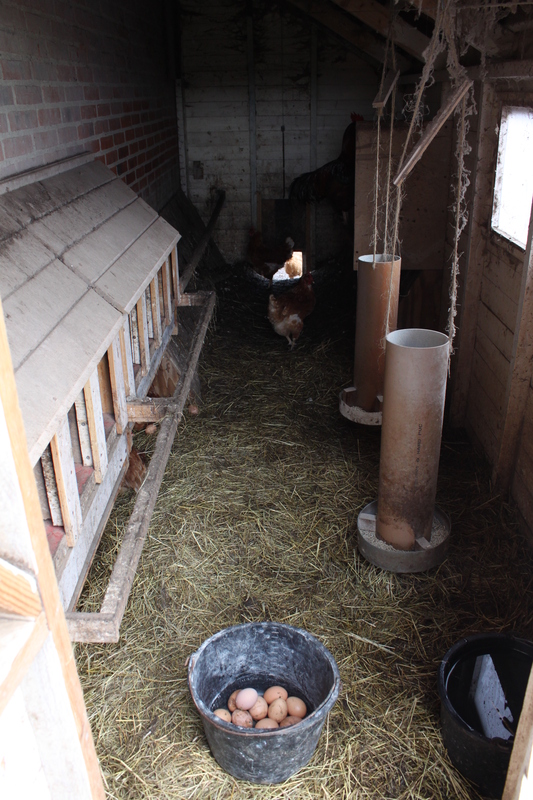 Once that single troublesome eggs is collected the hatch can be opened and the chickens run to freedom (all be it limited!) 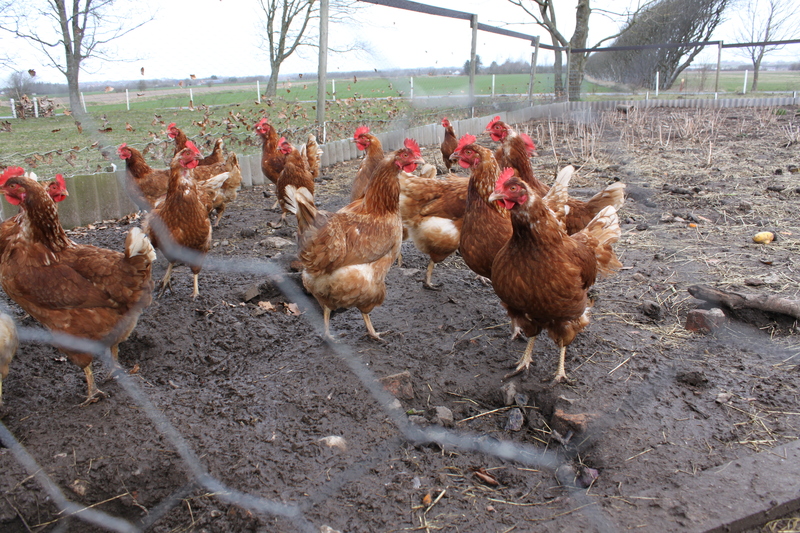 where they happily peck holes in the compost from the day before. I should probably mention that the animals are here as a hobby, not a business, and I can see the benefits of this! 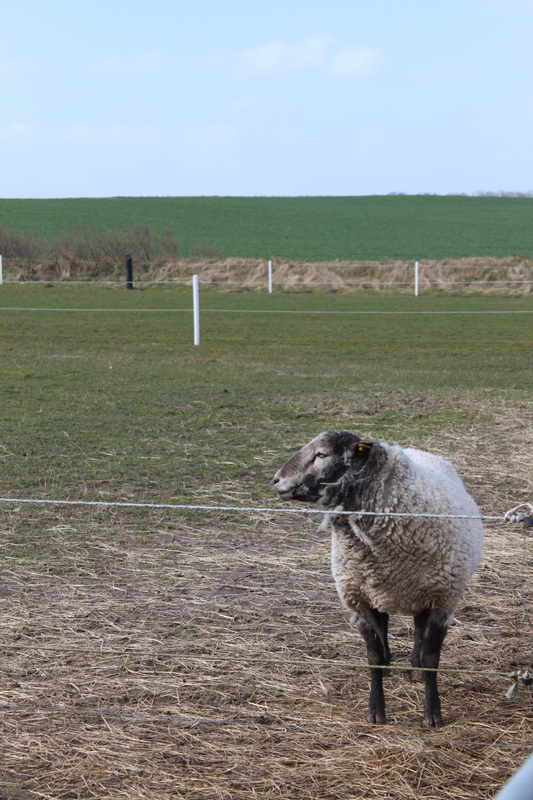 The animals provide you with endless hours of entertainment and company (especially the very springy lambs), ample opportunities for healthy outdoor physical exercise, a reliable composting service, food and wool! I’m really enjoying farm life and hope I can incorporate some of it into my future life, where ever the road leads.